Tagged under Cocoa Fujiwara, David Production, Series. Our heroine is the tiny Shirakiin Ririchiyo, daughter of the noble Shirakiin household and verbally abusive loli extrodinaire. But unlike most characters of that type, Ririchiyo realizes that her words are all just a front, and she hates herself for it. And in a way I can understand why she acts this way; because all that's ever mattered to other people when dealing with her was her family name. That’s why she has come to the Maison de Ayakashi, so she can build up the confidence to interact with people properly. Her plan is silly, but she honestly wants to change, and I find that admirable. It’s just lucky for her that a certain handsome, loyal Miketsukami Soushi arrived a day earlier to become her SS, or her Secret Service agent that waits on her every need. An earnest guy who will do anything for his tiny master. Awww! It’s looking like Miketsukami will be the key towards helping Ririchiyo open up and interact with others. After all, if she can deal with his antics, she should be able to handle anyone. Whether you will enjoy this show will depend on whether you can empathize with Ririchiyo, on whether you can understand the pain of bullying, regret and social anxiety, and whether you too have ever wanted to change yourself for the better. Personally, I can certainly understand these things quite well, having dealt with a couple of them myself, so I feel for Ririchiyo, and want to see her overcome her past. For me this was entertaining show because I was able to get into Ririchiyo’s (very tiny) shoes and really feel for her plight. If you can do that too, you might just find you’ll enjoy Inu x Boku SS as well. Unfortunately the ending felt rushed (while understandable because of Fujiwara-san's passing), it kinda left behind a feeling of meh. I think this story is wonderful, the main characters are very cute...especially Ririchiyo Shirakiin! 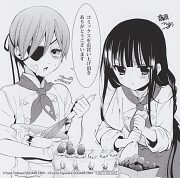 I like so much this manga because Ririchiyo ,although she had a difficult childhood, she tried to be strong and she has not lost his courage, however, she was unable to socialize with others,even Miketsukami has experienced the same situation and he ended up hating himself, because he was unable to prove emotions until he met Ririchiyo and was able to find freedom, true love and happiness .... Soushi x Ririchiyo is my favorite couple!! Amazing anime story, very beautiful and have a deeper meanings, feelings, and emotions, even the begining of this anime wasn't very strong and have a little events but u must watch because it's part of this anime , first i thought i will regret seeing this anime but unlikely i luv it so much, first the graphics is awesome it just make u want to watch this beautiful coloring BG, and the characters is nice, and i luv the ED of each Ep (nice idea) and it's Really an Anime worth watching . when i first saw this anime i thought it would be another silly romantic story but this anime was different, this anime has every thing it need to be awesome, the main characters (Miketsukami and Ririchiyo) are amazing, their drawing and personality are great, of course the other characters as well, and lets not forget about the graphics it is more than fantastic, however,what i really love is the anime's storyline, it was amazing and not repeated, it is really wonderfull,oh,i almost forget, Miketsukami transformation is amazing especially with all the cherry blossoms, it is really awesome,and also the chibi drawing is adorable,i wish i could voted 10 but i decreased it by 0.5 because the anime is only 13 episodes, otherwise it is really great and special anime and not to forget,i really enjoyed watching it. Loving it!<3 It so cute that she is short en he is tall :) But it is strange in the manga the name is "Youko x Boku"
( Youku is a nine tail fox and Boku is like a "goat") But now they change it too Inu x Boku. What means "Inu"? I would have to say that they did a pretty good job on making the anime similar to the manga. Sop this anime is basically Kuroshitsuji without the shounen-ai. 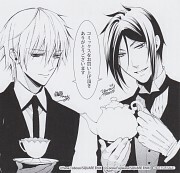 Everyone knows that the chic is basically Ciel and that the SS butler is basically Sebastian. That being said.... it made me love this anime~ There's even a character like the Undertaker and Grell. Honestly, the only reason why I probably love the series so much is because it reminds me of Kuroshitsuji. Although, the ED is hilarious for a couple episodes. I do not care for slavery, servilism and self-humiliation. I absolutely do not. That's the reason for which I started watching this series with reluctance. However, I had a nice surprise when the feelings of Ririchiyo made her think about her own place in the world. I appreciate when a girl have a firm character -without falling in tsundere issues- and do know when to ask for help. Normally, relationships depicted in this kind of series tend to be destructive and sick, so it was quite nice to see that both Ririchiyo and Miketsukami wanted to improve themselves and deserve each other. The same comment applies for the manga (which I'm still in the process of reading). Love the different EDs in each episodes. 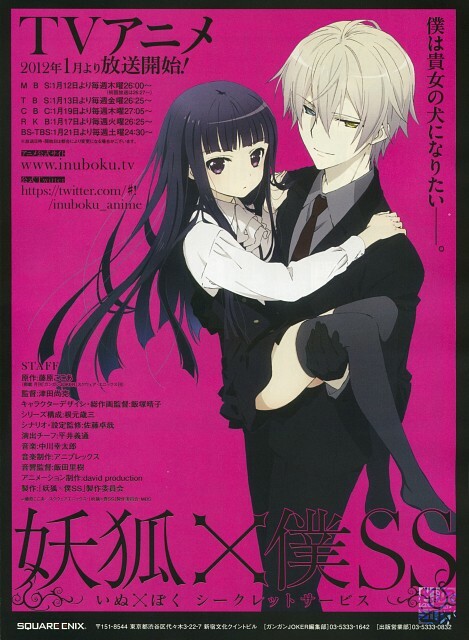 No feedback on Inu x Boku SS.